Configuring VMware's new vCloud Director can seem a little intimidating, but our expert shows you how to start the process in the first of this three-part series. tips on the initial installation and an overview of the terminology surrounding the product, along with covering some hairy experiences surrounding Oracle XE and 11g configuration with vCloud Director. But right now, I want to go back the starting point of that process and guide users through the initial "first-run" configuration of vCloud Director (vCD). This tip is based around a fictitious company called Corp, Inc., which I have used before. In this particular scenario, Corp, Inc., is a holding company that provides its many businesses with IT resources through the corporate data center. There are many ways to segment the cloud -- by department or by business function -- but I decided to opt for this sort of company where one business contains several others. For the purpose of this example, the cluster has been divided into resource pools, and quantities of CPU and memory has been set to reflect the different demands needed to run each of the company's internal infrastructure. Author's note: In the real world, I would hope that you would have more than three ESX hosts to run your private cloud! 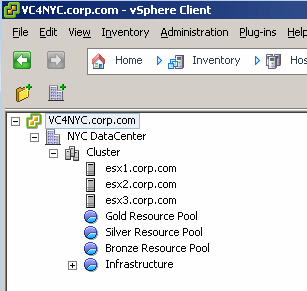 The "Infrastructure" resource pools run internal services required in the corporate data center and therefore are not accessible to any of the businesses that make up Corp, Inc. The job of the cloud administrator will be to separate each of the businesses into different Organization Virtual Data Centers, with a single Provider Virtual Data Center for the segments of the holding company that work elsewhere. Although the three companies are part of a much larger holding company, they still need to be separate for security and network reasons. To do the post-configuration of vCD, you will need to point your Web browser at wherever you assigned the HTTP port during vCD's installation. 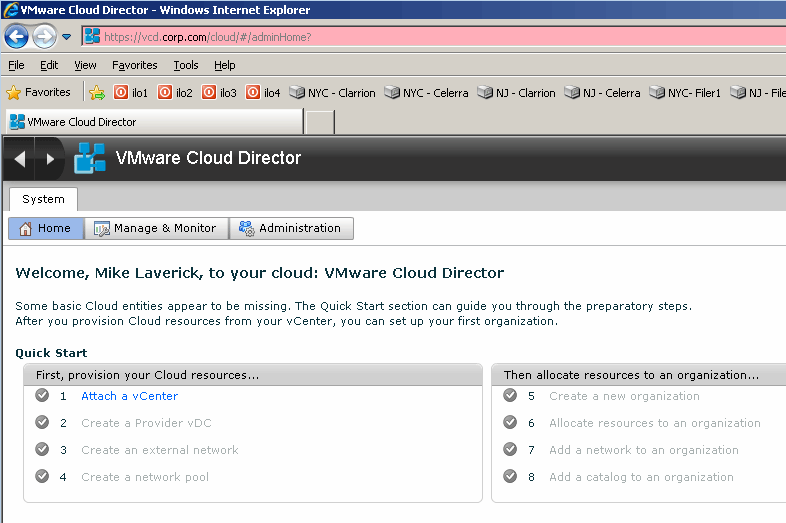 Once there, you will be greeted by the vCloud Director Setup page. Work your way past the obligatory welcome message, the EULA and the edit box to input your license key. 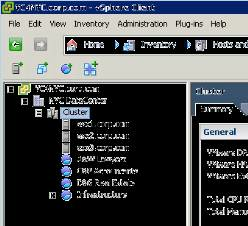 You'll then have to create an administrator account for the vCD environment. Remember, although vCD does support Microsoft Active Directory and other third-party LDAP providers, this account is stored on the vCD database back-end. The next step in completing the setup wizard is to configure the system settings to allow for unique identifiers. This part of the wizard permits you to set a unique system name and installation ID; these two parameters are used to identify the vCD instance, and they guarantee that network adapter MAC addressees will be unique for every virtual machine within the environment. You might think that, after all this, vCD would be ready to rumble. However, there is more to the post-configuration of vCD than meets the eye. There are another eight steps to complete before the system is configured. It is possible to carry out each of them out manually, but I would recommend using the “wizard” that drives this part of the configuration and learning where the various settings and objects exist afterwards. This method makes it far less likely that you'll make a mistake, and you'll also be able to add any needed additional components far more efficiently. These eight steps above are broken down evenly between two main tasks. First, you must specify what resources are available to vCD, and then you'll have to assign those resources to the business units. We will look at these steps in the next installment of the series.